The Salt Pan of African | The Africa Centre | Proud of our past. Passionate about our future. An eclectic exhibition of works from Khoi San (The founders of Southern Africa) artist Qaeahao and Nigerian (Yoruba) Taiwo Popoola. 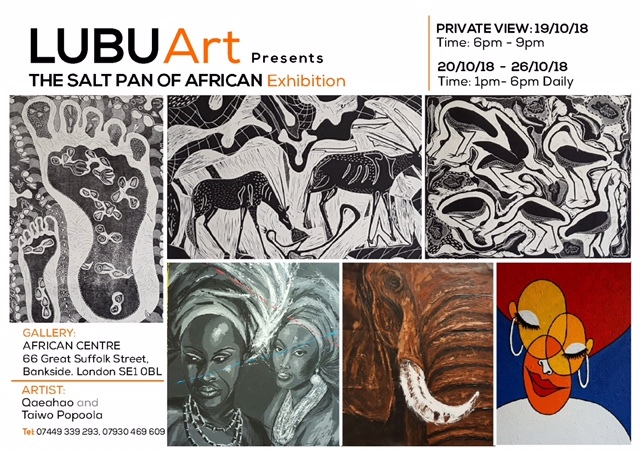 This exhibit is daily from 20th – 26th October 2018 in The Africa Centre Gallery. The Private View will be on Friday 19th October from 6pm-9pm.